The following is information regarding the Java based prototype for Unbound. The Java prototype was superseded by a C version, available here. Older prototype versions can be downloaded here. UNBOUND is a project to develop independent open-source DNS software and documentation. It is jointly funded by VeriSign, Inc., and the University of Southern California/Information Sciences Institute. This is our prototype full-service, iterative-mode, validating DNS resolver. It is written entirely in Java and is licensed under the BSD open-source license. Plus, other even harder to explain features! Note: as of unbound-prototype-0.10, support for NSEC3 validation is part of the trunk. Even more cutting edge versions (including branches) of the Java Prototype may be fetched via the subversion repository. Java, while a fine, fine language, isn't what we envision as the final implementation language of the non-prototype resolver. That would be C. For the prototype, however, Java was chosen because of the excellent DNSjava library and the familarity with the same on the part of one of the main developers. The intent is to use a prototype to explore and validate a particular design for an iterative-resolver and separable DNSSEC validator. The unbound-resolver was designed to be modular. 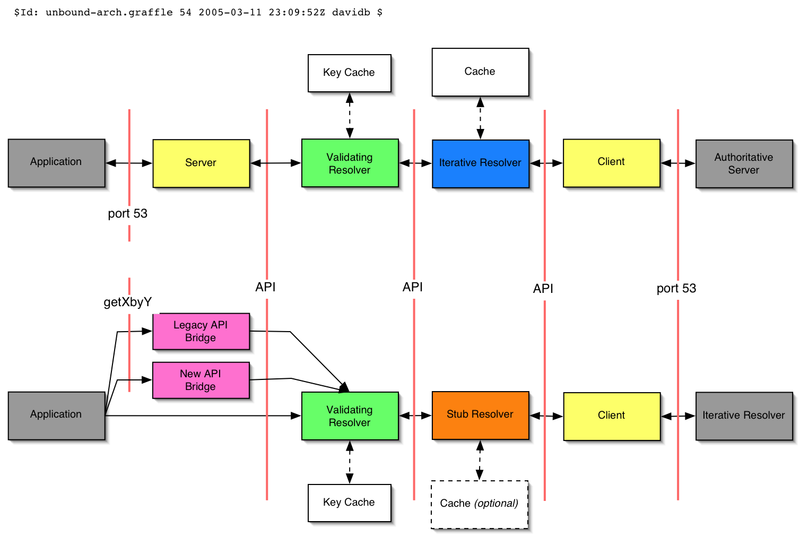 The idea was to create a "chain" of modules that could be brought together to form either a full-service resolver, or (for instance) a DNSSEC validating stub resolver. It also is designed to be able to use different implementations of a few key components, like the cache. Here is a diagram that shows the basic components. In the image, "API" is referring to an internal API which is not standardized per-se, but is internally consistent. This version of the prototype has been written as an event-driven, asynchronous server. Each packet that is received is turned into an event (along with a few internally generated events, like timeouts and generated queries).